Introduce your child to the exciting world of probability and statistics with these worksheets that are full of real life applications. Kids will have fun learning probability concepts with fun themes such as baseball, marbles, gummy bears, and worms. Then they can build on their maths skills and fractions prowess with probability games involving darts, coins, and jelly beans that are as entertaining as they are educational. Rock... paper... scissors! Discover a bit more about the maths behind this childhood game with this exercise in probability. This bag of sports balls needs sorting! Introduce your child to probability concepts with this worksheet. This maths worksheet offers students hands-on practise in calculating probability through simple, familiar scenarios. Probability can be as easy as rolling dice! What is the probability of rolling a 2? What about a 6? practise calculating basic probability with this worksheet. Get some practise with probability! With this exercise, your child will practise using fractions to express probability of different outcomes. What are the odds? Kids will learn about the important concept of probability by counting gummy bears in a bag. Which colour is most likely to be picked? 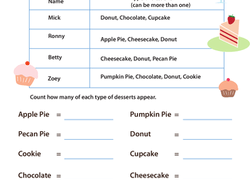 Give your second grader practise finding mode by finding out with this make-believe survey about favorite desserts. Give your child some practise with probability! With this exercise, he'll determine how likely each outcome of the prize wheel is. We all know a coin toss gives you a 50% chance of winning, but is it always that way? Delve into the inner-workings of coin toss probability with this activity. Bowl a strike as you calculate the probability of knocking down pins! There are ten pins set up. Which one will Todd knock down? Here's a great opportunity for your child to practise probability! He'll solve word problems about the probability of choosing an item from a group. Introduce your students to probability concepts and fractions with a helpful and familiar visual aide. Practise probability and fractions with some feathery friends! In this exercise, your child will determine the likelihood of certain birds flying away. Pick a card, any card! practise probability by exploring the various odds that can be found in a standard deck of playing cards. We don't condone gambling, but here's a fun worksheet to learn probability with playing cards. This fun and playful maths worksheet is an easy introduction to ratios, a big part of intermediate maths. Serve yourself some knowledge with this probability worksheet! This great page will introduce your child to probability concepts. Picking a random prize isn't just about luck, it involves maths too! With this worksheet, your child will practise determining probability with the grab bag. Kids will practise with fractions and degrees in this probability worksheet. Help your kid figure out the probability of a dart landing in different places. What are the chances that a dart will land on an even number on a dart board? Find out in this sixth grade probability worksheet! What kind of fish would you like to catch? Help your child master the concept of probability with this fun, visual exercise! Start out by explaining to your child that probability helps determine how likely something is to happen. Then, think of an event that would be fun to predict together. For your event determine the number of ways an event can happen and the total number of outcomes. For example, when flipping a coin, it will land on either heads or tails, so there is only 1 "event" that can happen. However there are two possible outcomes. So, the probability of the coin landing on heads is 1/2. Once you have determined the probability of your event, map it out on a probability line with 0 being "impossible" and 10 being "certain". For kids wanting to learn more about how to present data in a visual way, check out our Graphing and data worksheets.